Yes, I did it. I went overboard last Tuesday,(I'm a little behind). I can just see all those teachers shaking their heads and wagging their fingers at me. Oh well--It's got to happen once in a while, right? So here is what I did. Our last day in class was Thursday. So, we had to get the parent's Christmas gifts wrapped. 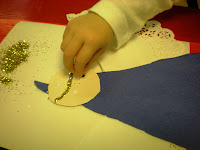 I always find this task a little ho-hum, but well, it has to be done. 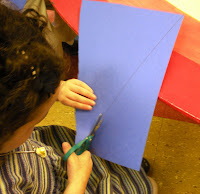 I take a large piece of construction paper, put the gift in it, we decorate it and then the children write their name on it. I wanted to add something fun, maybe have glitter. 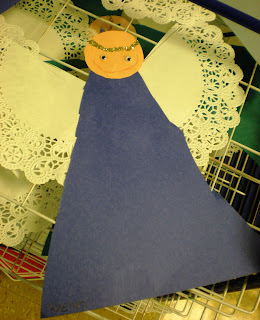 I also have been wanting to do the angel I posted last year, so I thought I would do that. 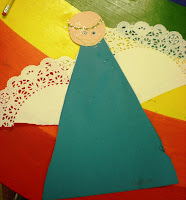 Instead of using handprints, I used a doilie. 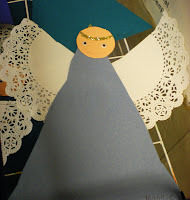 I had the children cut out the triangle for the angel's body, cut the doilie in half for the angel's wings, glue the pieces toghether, and add a glitter halo. 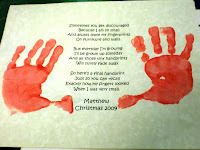 The children did wonderfully, but I was EXHAUSTED! I won't do that again. Ha, ha - I have done the same many times where I have this great idea and end up with way too much to do. 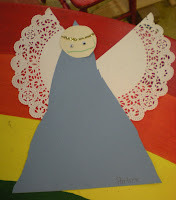 Your angels turned out absolutely darling so it was definitely worth it:) Have a Merry Christmas and I look forward to all your great ideas in the new year. Very Cute! Putting it on my list for next year. That's awesome! The angels are really rocking! 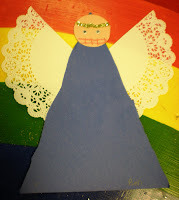 My sister made one of those when she was little!